very basic knowledge on high school mathematics, science, sociology and fine art. The class introduces Buckminster Fuller and his inventions for solving global issues.The class is a subject between design and engineeringThe class introduces Fuller’s thought on global issue too. But this class forces you to learn by practicing his design.The class demonstrates the essence of the technologies by model making. Buckminster Fuller regarded the earth as an well-designed spaceship. He have invented a series of technologies to sustain our biosphere according to his argument that how to deal with problems that may damage the spaceship’s mechanism. His unique achievements lies in his design and engineering rather than his thought on global issues. To practice these, he develop his original design theory. The theory is based on his original geometry. And the geometry is not based on difﬁcult mathematical formula. And we can learn the geometry by model making.This class aims at learning the practical design tool. By demonstrating and exercising model making participants are able to acquire the tool and to develop an idea that is free from any conventions and prejudices. The class is a design and engineering class. I need all participants to remind that the class requires extra works and extra expense for your productions. spaceship earth- lecture: introduction on Fuller’s rendition of our planet. 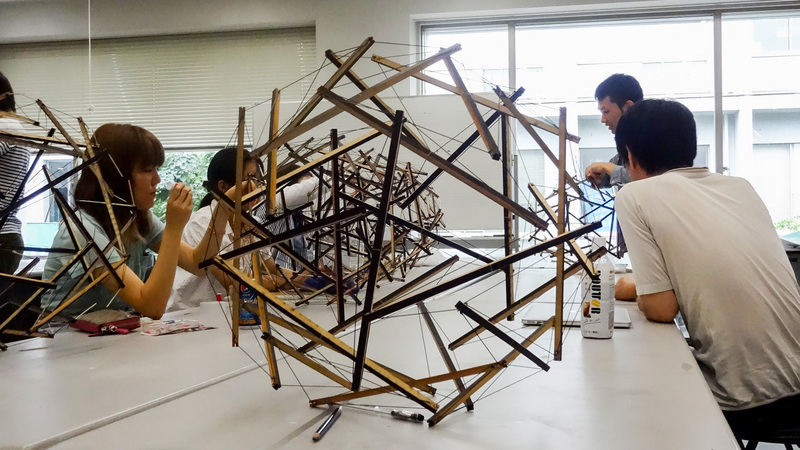 geoscope- lecture and small workshop on lecturer’s production, display furniture for a museum by using tensegrity. Hajime Narukawa Laboratory © All Rights Reserved.